"Harry & Meghan's Windsor Knot"
"Harry & Meghan's Windsor Knot" has been brewed to give the traditional British pint a U.S. twist in honour of the nuptials of the transatlantic couple who will get married at Queen Elizabeth's Windsor Castle home, west of London, on May 19. 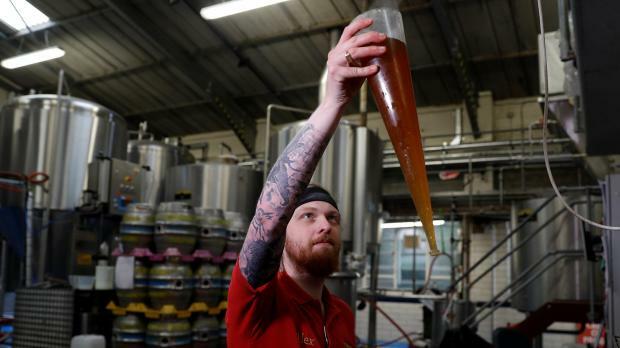 "With the authenticity of being brewed here in Windsor in the shadow of Windsor Castle, using local ingredients, it has got a fantastic appeal," said Will Calvert, 60, one of the directors of Windsor and Eton brewery. According to the brewer, the pale ale is made from barley grown in Windsor's royal farm, to represent Harry, and combined with hops from the west coast of America, reflecting Markle's heritage. It is a sequel to the "Windsor Knot" beer the brewery first made in 2011 to mark the wedding of Prince William, Harry's elder brother, to wife Kate. That brew was supposed to be on sale for only a couple of months but the brewery said it was so popular that it is still being made and sold today. The town has royal associations that go back centuries and Windsor, the oldest and largest inhabited castle in the world, has been the family home of British kings and queens for almost 1,000 years. Harry and his brother William both attended the nearby exclusive Eton College school which lies on the opposite bank of the River Thames. In a local Eton pub, the latest royal beer got a seal of approval from two American customers. "Pale ales are quite popular in the United States and I really think this is a good one," said Jaime Naber, a 38-year-old from Wisconsin who was visiting a friend nearby. Traci Bunch, 48, said it would get the couple's approval if they tried it. "I think they'll love it," she said, gulping down the last drop of her beer.